We breed only what we train and train what we breed. It is important for the reader to fully understand the significance of this statement. 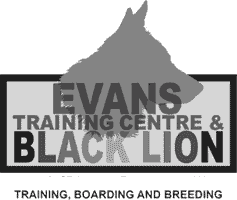 The professionals at EVANS TRAINING CENTRE and BLACK LION KENNELS have over 70 years of combined experience in the training and handling of more than 5,000 dogs. Our breeding program is objectively based on this experience. 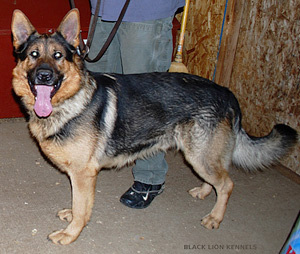 Dogs from the breeding programs conducted at Black Lion Kennels are the result of judicious testing in "real world" applications. The matching of a specific sire to a specific dam is carefully and objectively planned in order that the offspring have the consistency in ability that we demand. Many programs state the quality of their breeding on specific "genetic lines" to give credence to the offspring. The concentration of DNA matter to enhance specifically targeted traits such as conformation, disposition, innate "drives" and behaviour are well known. Some outstanding breeding results and examples can be seen in the accomplishments of specialized dogs in the arena of field and livestock trials, tracking, obedience, conformation, agility and sport (schutzhund, mondio ring, etc.). The creation of outstanding examples of the breed is the goal of every serious breeder. Herein is the difficulty presented to the competitive breeder. As an example, the enhancement of traits for specific "positive" behaviours (ie. prey drive or movement energy) results in the diminishment of a "negative" behaviour (i.e. tractability or calmness). For high level sport competitors an emphasis on the identified "positive" behaviour is imperative. For those who do not compete but still desire a dog with good "workability" the need for very high energy is not as important. Such handlers prefer a dog with an "off-switch". The following information will clarify the above in brief. The dog’s world differs from the human in some very specific ways. His world is predominately one of odours. His nose tells him countless things about the environment that entirely escapes humans. He is more sensitive to sounds. His vision is considerably inferior to human vision, and for this reason he depends less upon it. He prefers to approach closely to objects that must be examined. However, his sensitivity to the movement of objects compares favourably with human sensitivity of this kind. To find a dog’s ability or quality in a particular trait, one must seek it directly. To discover whether a dog is gun sure, one must test him with a gun. To discover whether he is intelligent and willing, one must train him. At present, there is no reliable short cut. The senses of the dog with which the working dog trainer must concern himself chiefly are those of vision, hearing, smell, and touch. (1) Structure and physiology of the eye. A striking difference between the retina of the dog’s eye and the human retina is that the former lacks a fovea. When a man focuses his eyes upon any object, the light reflected from that object is thrown upon the fovea of the retina. He can see many other objects besides that one, but they are seen indistinctly. This can be tested readily enough by focusing the eyes upon any word on this printed page and then trying to see how many other words can be read without moving the eyes. The words reflected upon the nonfoveal portions of the retina are blurred and poorly defined. Since the dog lacks a fovea, one may expect that even an object upon which he focuses is seen less clearly than it would be by humans. It seems certain that a dog can most conveniently and comfortably see objects which are at a distance of 20 feet or more. (2) Perception of movement. There is a type of visual stimulation to which dogs seem very sensitive. If any object is moved even slightly, most dogs will detect and respond to the movement. It is observed that the slight movement of an object in the vertical plane could be distinguished by dogs from movement in the horizontal plane, and also that discrimination between clockwise and counterclockwise motion was possible. (3) Colour vision.The bulk of experimental evidence supports the opinion that to dogs the world looks like a black and white photograph. (4) Value for training. Experimenters are agreed that dogs make scant use of their eyes in learning except in detection of motion. (1) Nature. Tests show that dogs hear sounds too faint to affect human ears. In one test, a German Shepherd at a distance of 24 metres responded to a sound of which a man could not hear at a distance of more than 6 metres. Common observation supports these experimental findings. It seems apparent, too, that the dog hears sounds of higher pitch than affect human ears. The dog’s ability to discriminate sounds of varying intensity is on a par with human ability. With respect to pitch discrimination, the case is not so clear. (2) Use in training. The exact elements of a command situation which are effective depend upon the nature of the dog’s training. No doubt, inflection, the actual words and gesture all play a part. If it is intended to use a dog at night, or under any circumstances where the handler cannot be seen, it is important that he be trained to respond properly without benefit of gesture. Most dogs can readily be instructed to respond to a number of oral commands. Some of them appear to understand most accurately the feeling of the handler as it is conveyed by his voice. Some dogs, however, cannot be reached effectively through the ear. These are generally not desirable for working dog training. (1) Nature and physiology Dogs so far surpass man in keenness of smell that it is difficult to imagine the nature of the sensations which they receive. Just as it is probably impossible for a dog to imagine what colours are, so it is impossible for the human to conceive of the vast range of odours and the delicate differences in chemical shadings to which dogs are so sensitive. The dog’s nose is ideally adapted for the detection of minute amounts of odorous particles. Its snout is kept moist by a glandular secretion and is extremely sensitive to slight currents of air. A generous sample of air passes into the nasal cavity and over the mucous membrane which is richly innervated with the finely subdivided endings of the olfactory nerves. This mucous membrane is supported on a complexly convoluted bony structure. Its structure is such as to present a maximum surface with a minimum obstruction to the circulation of the air. In general, studies show that dogs can respond to odour traces of all known sorts and in dilutions far more extreme than can be detected by man. (a) Tracking capacity depends upon other traits besides olfactory acuity. 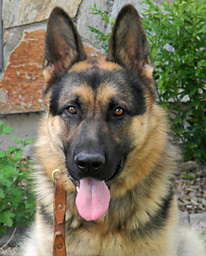 Almost any German Shepherd has sufficient acuity to become a good tracker, but only the exceptional dog possesses the ability to use his nose properly. More explicitly, it is only the exceptional dog which can be trained to follow accurately any trail his handler sets him on, regardless of what other olfactory cues he may encounter. Any dog can trail a rabbit, or a female in season. Only a few will, on command, follow the trail of a stranger leading through traffic, under snow, near a kennel full of dogs, or past a groundsquirrel hole. 1. Earth odour from the compression and stronger vapourization of those areas stepped upon. 2. Plant odour from the destroyed vegetation. 3. Odour traces from shoes and their preservatives. 4. Odour traces from decaying animal or other organic matter. 5. Body odour specific to any particular person. (c) Visual cues are of slight assistance to him. (d) Many severe field trails supply good reason to believe that certain dogs can be trained to unravel a human trail despite numerous cross trails and other obstacles. Tests with chemical rather than natural trails lend further support to this conclusion. (3) Working dog significance. When working with dogs, a trainer can hardly avoid noticing that some are far more susceptible to odours than are others. For some forms of work, such as tracking, great acuity is essential. Many dogs with remarkable noses have been in the hands of efficient and observant handlers who have employed them successfully in the tracking of criminals under difficult circumstances. They have followed trails which were old, and crossed and recrossed by fresh ones; they have worked out trails covered by fresh snow. On the other hand, for some functions such as casualty work, olfactory acuity is not essential to good work. In fact the dog’s interest in odours may be brought to the attention of the trainer because it interferes with work. An animal may show more interest in the trails it crosses than in the work it is supposed to be doing. Except when especially required to do so by man, a dog does not frequently make use of his ability to follow a human trail. If he becomes separated from his handler in unfamiliar surroundings he will trail him, but ordinarily, when using his nose for his own purposes, a dogs pays attention chiefly to traces left by other dogs and by animals which are potential prey. (4) Touch. There is a wide variation among dogs in the sense of touch. Certain dogs are very susceptible to manual caress or correction. Others appear to be relatively insensitive to it. These are generally not desirable for training. In using the term "sensitivity", reference is made not so much to the stimulus threshold per se as to the threshold in terms of fear response. In other words, the oversensitive dog is startled by stimuli (sounds or touch) of lower insensity than is required to disturb the average dog, but his response is often one of flight and trembling. The normal dog responding to such stimuli might merely turn his head. a. Relationship between body and ear sensitivity. Records suggest that body and ear sensitivity vary quite independently. Of 123 dogs rated as under-sensitive to touch, 51 were also under-sensitive to sound and 67 were medium sensitive to sound. For 220 animals that were medium-sensitive to touch, 140 were medium-sensitive, 60 under-sensitive and 20 over-sensitive to sound. The indicated independence of the two forms of sensitivity suggests that shyness (oversensitivity) is not centrally determined, but is based upon receptor peculiarity. That is, it appears that shyness results from the extreme irritability of specific nerve endings; sureness, from the lack of it. A sound may actually "hurt" a gun-shy animal and yet a blow may not bother it. b. Implications for working dog training. Trainers should have no difficulty in rating dogs with respect to the efficacy of stimuli, and from a practical standpoint the classification is helpful. 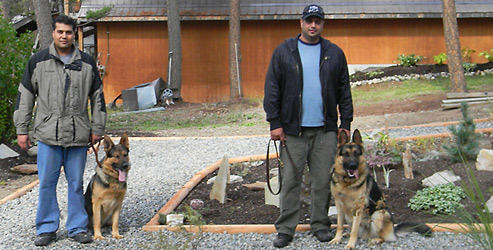 In training dogs, the voice and hand are utilized almost exclusively in correction and reward. Thus, in the course of his regular work, a trainer cannot help but form a definite opinion with respect to the response of his student to auditory and tactile stimuli. Oversensitive dogs. A dog that is oversensitive (shy) is so handicapped that it is not likely to demonstrate what intelligence it possesses in a form which the trainer can utilize. Dogs shy to either sound or touch are difficult to train and are unreliable. Certain dogs, showing only a mild degree of sound shyness, can be accustomed to sound through repeated stimulation. But these near-shy dogs cannot be used where reliability in the face of noise is a life-and-death matter. In general, then, an oversensitive animal can be trained only with difficulty, if at all, and it cannot be trusted implicitly. Undersensitive dogs. A dog that is undersensitive to both sound and touch is also very difficult to train. One cannot "reach" him readily to give either correction or praise. A dog sensitive to sound or touch, but not to both, can be instructed readily enough by a trainer who discovers the right approach. He must utilize his voice in one case, his hands in the other. Ideal dogs for training. The ideal dog (that is, ideal in the hands of a good trainer) is somewhat sensitive to both sound and touch. A mediocre trainer may spoil him. Such dogs tend to either do very well or rather poorly, depending principally upon the wisdom with which they are handled. This term refers to the degree of spontaneous activity of the dog; that is, to the speed and extent of his movements in general, not in response to any command. Dogs differ widely in degree of spontaneous activity exhibited, and the task of rating them in this respect is easier than that of rating for other functional traits. Above-average energy is not particularly necessary for working dog purposes. a. The extreme manifestation of aggressiveness is seen in attack. In general, a dog which is rated under-aggressive cannot be taught to attack. The dog of average aggressiveness can be taught, though less readily, than an animal rated as over-aggressive. The only difficulty in teaching the latter consists in securing prompt cessation of attack upon command. b. The average and the under-aggressive dogs rank about the same in energy, but the over-aggressive group includes a high proportion of dogs of great energy. This is in line with the observed fact that a dog can be made mean and his aggressiveness increased by keeping him attached to a short chain for a period of time. He cannot release the energy he generates. Specific breeds of dogs might not have earned a reputation for over-aggressiveness were they not kept so closely confined. a. Intelligence generally is the trait most closely related to a dog’s success in workability. b. A dog’s rating for intelligence is based upon the readiness with which he learns and the extent to which he retains and uses what he has learned. It should not be assumed that by intelligence is meant the ease with which an animal conforms to the demands of the trainer. Certain dogs learn very readily, but are instructed with great difficulty. They are able to learn how to avoid doing the work demanded by the trainer without, at the same time, incurring serious reprimand. In a general way, then, a dog is rated high in intelligence if he is unusually capable of profiting by experience, regardless of whether this is to the full satisfaction of the trainer. This term is an arbitrary one used to refer to the dog’s reactions to man and especially to his trainer or handler. 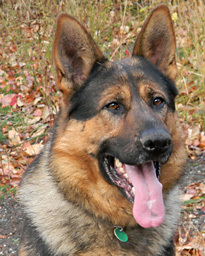 The term applies not only to the nature of the dog’s response in a command situation, particularly his response to an act which the animal has already learned, but also to the learning of new duties.The dog may make the requisite response to the command or he may make some other response. a. Willing dogs. An animal is ranked high in willingness if he persistently responds to his handler’s requests with an effort to fulfill them, even though reward or correction is not immediate. Whether the animal possesses the requisite intelligence and physical strength, whether it succeeds or fails, is not considered. b. Unwilling dogs. If the promise of reward and the threat of correction must constantly be before the dog in order that he work properly, he is considered an unwilling worker. There is a large group of dogs perfectly capable of executing the required movements but strongly inclined not to do so. Many such dogs appear to make a nice distinction between work and play. They will take great pleasure in retrieving, in searching for objects, in taking jumps. 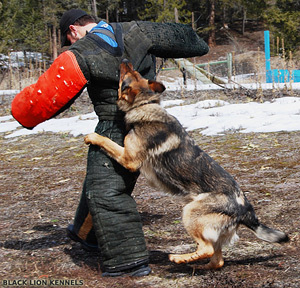 Such a dog, after training, will at times go to his handler spontaneously and apparently suggest a romp which may include any of the acts mentioned. He will then respond, promptly and appropriately, to commands to retrieve, search, jump, track, etc. If, however, the situation is reversed and the handler initiates the activity, the dog may seem to have forgotten all he ever knew. c. Basic considerations. Certain considerations are basic to proper understanding of a dog’s willingness or unwillingness. Relation to trainer or handler. A few dogs will work willingly for only certain people, often for only a single individual. Most dogs show unwillingness when commanded by a stranger. Certain animals have proven to be stubborn, regardless of who trains and handles them. It is very evident that the best results are obtained when a dog and man are carefully matched. In any event, a dog’s rating for willingness should be only in relation to his trainer or handler. A dog should be penalized in his rating on this trait if he readily shifts his "willingness" to another person. Willingness can be enhanced or inhibited by the person who handles the dog. Improper handling may make a dog less willing at one time than at another. It is for this reason that some dogs may show less willingness under their trainers than under their handlers during service. It is also for this reason that some dogs will work willingly during the first 5 minutes of a training period but, perhaps because of impatience of the trainer, unwillingly during the remainder of the period. Other dogs, however, just naturally seem to become unwilling after a few minutes. They should be rated relatively low in this trait. Undersensitivity may be confused with stubbornness. Certainly a dog that is undersensitive to both sound and touch may appear to behave unwillingly, when, as a matter of fact, the commands and the motivation supplied by the trainer are less effective merely because of the limitations of the dog’s sensory system. When in doubt as to whether a dog’s refusal to perform learned chores is due to stubbornness or forgetfulness, one can keep the animal shut in the kennels for a few days. The dog that is merely stubborn will then gladly run through his exercises for the privilege of being at large. The physical structure of the dog will determine to a very high degree the uses for which it may be suitable. 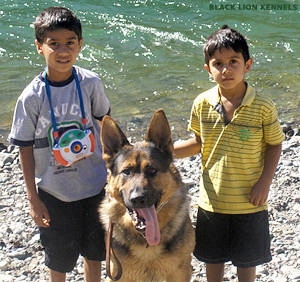 "Working dog" conformation is a first and foremost priority. All breeding dogs at Black Lion Kennels are tested and evaluated for performance in endurance (16 km non-stop trot), swimming (20 min. non-stop), and agility platform routines.